Modern Heating and Plumbing can help you identify your needs and make the best plumbing choices for your home or business. We can help you transform your bathroom into a functional retreat for every age. and make sure your family always has a warm shower. We can assist you in creating the perfect kitchen. Count on us for everything from complex installations, to routine service and maintenance. Be smart about your money…”For Your Family’s Comfort,” hire Modern Heating and Plumbing, your qualified licensed professional. Toilets come in many shapes, styles, colors, heights…not every toilet is right for every person. When choosing a toilet you need get a toilet to suit your needs and design wishes. TOTO toilets feature classic configuration and have price points adaptable to any budget. The Drake two-piece toilet is available in a number of colors; ADA compliant seat height and varying gallons per flush; with up-grades including SoftClose seats or Washlet. TOTO’s goal is always to advance thought to generate improvements and progress. Featuring three flushing technologies: Dual Max, Cyclone and EMax, TOTO toilets are a leader in perfect flushing. Kohler’s Highline toilet features clean simple design and efficient performance. The Highline water conserving toilet, at 1.28 gallons per flush, gives you significant savings of up to 16,500 gallons per year as compared to a 3.5 gallon flush. And that is without sacrificing flushing efficiency. Kohler’s Highline toilet features an elongated seat and a 16 inch Comfort Height bowl (which is the average height of a kitchen chair) to ensure complete ease in using your toilet. For over one hundred and forty years, American Standard has led the way in developing innovative bath products, including high performance toilets, like the Champion 4, with a 16″ rim height, 1.28 gallons per flush and an EverClean surface. The American Standard EverClean surface is a permanent glaze additive that helps keep the surface clean longer by inhibiting the growth of stain and odor causing bacteria. Whatever style or innovation you’d like in a toilet, stop by and see us at 18550 US Highway 59 North in Detroit Lakes. 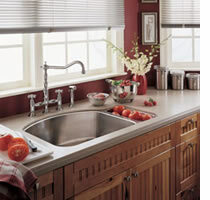 Color trends in the kitchen have made their way to faucets, with the introduction of Delta’s Fuse Kitchen Collection. Mixers, blenders, stoves are now available in a variety of colors and the Fuse faucet is another way to add color to the kitchen. The Fuse pull-down faucet is available in three colorful options: Stainless/Cracked Pepper (Black), Stainless/Chili Pepper (Red) and Stainless/ Snowflake (White). These faucets coordinate beautifully in a variety of kitchen environments, giving homeowners the ability to customize their faucets with colors that fit the color palette of their kitchen. 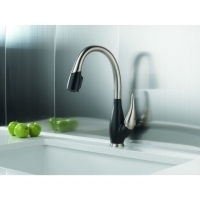 Faucets in the Fuse collection maintain many of the added features of Delta’s line of pulldown kitchen faucets which include Diamond Seal Technology to provide hassle-free installation and long lasting performance and the Magnatite docking to firmly hold the pull-down head in place. The Fuse Kitchen Collection’s soft contemporary design plays well with both traditional and contemporary kitchens. “For Your Family’s Comfort,” stop by Modern Heating and Plumbing at 1040 Randolph Road and we’ll help you choose the perfect faucet for your kitchen! 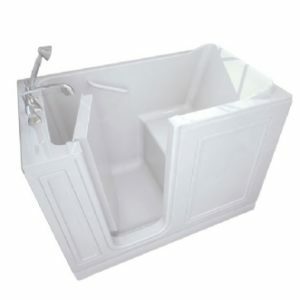 Enjoy warm, fully immersive baths safely and comfortably! Imagine yourself fully immersed in a comfortable, warm, luxurious whirlpool tub right now. Can you feel your muscles relax? Can you feel the stress release from your body? Can you feel your joints loosening and pain subsiding? Yes? Then you’ve just imagined yourself in an American Standard walk-in bathtub. Utilizing the latest technology, American Standard walk-in baths offer the healing benefits of water therapy to ease common ailments such as arthritis, rheumatism, back aches and sore knees. American Standard walk-in baths offer not only a luxurious bathing experience complete with a myriad of benefits, but also easy-to use controls and low maintenance. The “Quick Drain” allows you to exit your tub when you are ready, so there’s no long wait for all the water to drain before you open the door. “For Your Family’s Comfort,” come see these tubs at Modern Heating and Plumbing located at 1040 Randolph Road in Detroit Lakes. Mention you read this in our newsletter and receive an additional five per cent off your purchase good through the end of May 2012. You may have been wondering, ”What parts are actually in a water heater?” Gas water heaters and electric water heaters are very similar. Electric models use two heating elements to heat water while a gas model has a gas burner at the bottom with the vent pipe running up through the middle of the tank. Both types of water heaters have: glass-lined steel tank that holds the hot water; environmentally friendly insulation surrounding the tank; a dip tube to let cold water into the tank; thermostat to control water temperature; drain valve that allows you to empty water from the tank; temperature pressure relief valve and an anode rod (helps to keep the tank from corroding). Another question you may ask is “how do I choose a water heater?” What you need to know are things like: is the heater gas or electric; is the heater for a home or mobile home; what is the height and diameter of your current water heater, how many people live in your home, do you have high demand for extra hot water like a whirlpool or over-sized soaking tub or a number of teenagers living in your home and length of warranty you desire. The Hydrorail allows you to easily up-grade a standard shower to a spa-like showering experience with overhead rain and hand shower functionality. Designed to accommodate a wide array of bath-shower configurations, without altering in-wall plumbing, makes Hydrorail suitable for both remodels and new construction. Hydrorail converts your single-outlet showerhead into a two-outlet custom shower- ing experience. You’re Sure To Fall in Love with Just One Touch! With Touch20 Technology, it doesn’t matter if you have two full hands or ten messy fingers. Just tap anywhere on the spout or handle and the water is running. 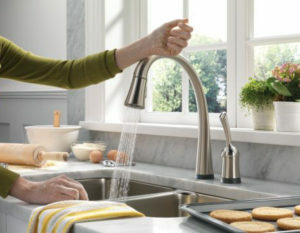 The intuitive tap technology enables you to turn the faucet on and off with just a touch. The Touch20 Technology conserves water. As you are preparing food or washing up in the sink, just tap the faucet with your wrist, arm or even your elbow to keep water from running when you don’t need it. In “Touch Mode” water temperature and water flow will be whatever it was with the previous use. There is an automatic shut off feature, after four minutes, if there has been no activity. By definition, a “fixture” becomes a built-in portion of your home. You’ll use these showers and tub/showers every day, a majority of households use each fixture several times a day. 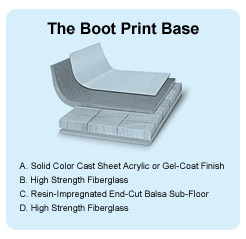 The number one difference, in Warm Rain products, is the “boot print base.” The most important aspect of any fixture is the bottom base. The bottom base is what takes the majority of weight in a shower, whirlpool or tub/shower. Warm Rain has been recognized as making the strongest fixtures and is handcrafted by American workers. Warm Rain products also put a lot of valuable extras into every unit they manufacture. Warm Rain walls have built-in reinforcement for the shower door or curtain rod; built in front apron support and they are hand rolled for exceptional strength and durability. Warm Rain products also come in a variety, of one piece sizes and break down units, from single stall showers, four foot showers to full size tub/shower units. When it comes time to build your new home or remodel your existing home order the very best…Warm Rain. Stop by our showroom at 1040 Randolph Road to view and buy Warm Rain fixtures. You will have many trouble-free years of happiness with these handcrafted Warm Rain units.